Issues are on their way! Issue one of Linux Voice is printed and on the way to subscribers! Some lucky people received it this morning; the rest of you should get it over the next few days depending on the efficiency of the postal service. Meanwhile, it will be on sale on UK newsstands from the 27th of February, and in other newsagents around the world after that. All subscribers have been emailed with information on accessing the digital editions – some mails bounced back, so if you didn’t get an email, contact mike@linuxvoice.com. For those of you who haven’t been lucky enough to receive it yet, a few of the highlights are: the 51 best things about free software in 2014, Bitcoin, old-school programming with Ada Lovelace, and brewing beer with the Raspberry Pi. That’s just the tip of the iceberg though. It’s 114 pages jammed full of Linux goodness, and as it’s issue 1, it’s sure to become a collector’s item in years to come. I’ve literally just picked mine up from outside the front door, made myself a nice cup of tea and I’ve settled down to read all that Linux goodness! Congratulations guys! Just got my copy in the post – very exciting! Kettle on….. If I subscribe to the digital version, will I be able to recieve issue #1 in PDF form or pay for a copy of it? If you buy a digital subscription now, yes, you’ll get issue 1. Print subscriptions start from issue 2 though. 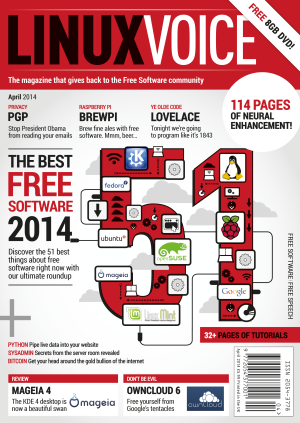 12 issues of Linux Voice, one per month, in digital format. Initially this will be as a PDF, but we plan to do a lot more. Your first issue will be #2 (available in late March). Yes, sorry, digital subscriptions still start from issue 1. I updated the whole shop when the print mags were posted out, but I should’ve left that. Thanks for pointing that out! Ha ha ha ha. My shiny new linix voice mag is here. Looking good – except for the poor shavong skills. Looking forward to reading it in the water closet. Lol. If you are changing my wording, you could have corrected my spell fat finger spelling mistakes. Any chance there’s going to be an [epub] app, at the least for Android so’s I can read it on my tablet/reader? I personally like the way Linuxjournal made theirs. That’s the plan, yes, but it might be a few months off. We’re incredibly busy getting the magazine established, but in time we’d like to offer more formats than PDF. Thanks for your patience! A good generic epub reader for Android is fbreader. It’s available through Google Play as well as f-droid. Congratulations on your first issue. My copy was on the doormat when I got back from work. Many thanks; a grand start to the weekend. A pleasant surprise when I got in from work – that’s my train reading tomorrow sorted. Congratulations on what seems like an excellent first issue. It is a bit uncool that us digital subscribers only get it the same time some random punter off the street can. I contributed straight away when I heard about Linux Voice and even paid a bit more because I believed in the concept. At least let me get it a few days before the stores. What is the reason that us digital subscribers have to wait until the newstand release of the paper mag? I would have expected to have received the PDF at the same time the paper subscriptions were hitting the doormats. Andy, we expected the UK print subscriber copies to arrive a couple of days before the on-sale date of the 27th. We planned to do everything on the 27th (like opening the digital archives) to keep it all in sync. Because some subscriber copies arrived much earlier than expected, we understand it must be annoying for digital subscribers. For issue 2 we’ll work to get all of the dates much more in sync. Thanks for your patience! I find it totally unacceptable that digital subscribers get it a week after paper subscribers. Linux Format used to do this and it pi**ed me off so much that I cancelled my subscription!! Ian, we expected the UK print subscribers to get their copies two days before the official on-sale date. So instead of having to tell everyone several different dates, we decided to set that on-sale date (27th of February) as the main one, and launch the digital edition then, so everyone was in sync. Our distributor sent out the UK print copies earlier than we expected, so I understand your frustration. Sorry and thanks for your patience. We’ll try to make it clearer and simpler for next issue. Changing the timing of printing and distributing dead trees takes time. Distributing the digital version does not. It’s not as simple as that. We’re working on a special subscriber area where people can log in and download issues. This takes time to do right, and we’re working on it for the Thursday launch. Some UK subscribers got copies earlier than expected, and we can’t just magically finish the digital subscriber area. We’re not ripping anybody off — digital subscribers are still getting their issues on the planned date. For next issue, we will try to get the dates aligned better. The LV guys have quite a difficult job, not only do they have to produce a magazine they also have to build their website and infrastructure for distribution. So I very much agree with James above, give them a break you only have to wait a few days its not the end of the world, your stretching the definition of unacceptable quite a bit. But they have known this for several months since getting the funding. The web infrastructure should heave been in place before distribution of the first issue. But I do agree that it is a big task without corporate backing. Two months Ian. Not several. And in that time we’ve had to source a distributor, source a printer, source a disc duplicator, source hosting for the website, write 114 pages of content, travel to do interviews, handle company and employee registration forms, and a million other things. And there are just four of us, not even being paid yet. We’re doing this because we love Linux and love the community we’ve built up. We can’t bend time. Given the time frame involved and the scale of what they are doing what they have done so far is an incredible achievement. I’ve been involved in the formation of a new company and there is an incredible amount of work in setting up a new business and getting a new product/service out the door. They seams to be the odd person who thinks that this sort of thing is easy and but a few moments work. I would suggest that perhaps those people have not given too much thought to the amount of work involved and certainly have not been involved in the founding of an new business. I for one was thrilled to receive my download link ahead the announced date of the 27th — and well before it will be available on shelves here in the States, I suspect. Even if it had come late, it would have been worth the wait. Mike and company: as to your goal of producing a better magazine than Linux Format, you’ve really (to use the obligatory baseball metaphor) knocked this one out of the park! I got the magazine today and… I’m impressed. So impressed that I’ve done a review: http://beepmode.co.uk/blob/archive/linux-voice-review. (Hope the minor criticisms don’t cause offense – you guys really have done a great job ;). That’s interesting, and good to know. Its all true! My neural network has been enhanced and they are giving away precious nuggets of green. I haven’t received my digital copy, yet, and I’m happy to read that I will by the 27th. I’m not cheesed-off, I don’t mind if someone has already read it and I haven’t, because the reasons Mike Saunders has pointed out seems reasonable to me and I’m sure they all are sleeping very little during these days. Of course I’m very curious and I’m looking forward to read it!!! This is just to say thank you guys for your effort, from a digital subscriber too. I find it sad that the stupidity of the corporate publishing world has carried over into this magazine. Firstly, for a magazine published at the end of February, why is the front cover labelled ‘April’? Secondly there is a flash across the top right of the cover stating ‘free 8GB DVD’. This is not free, but is included in the cover price of the magazine. If it was ‘free’ then I would be able to go into the newsagents and help myself to the DVD without buying the magazine!! I had hoped that now that you were free from a higher corporate control that you would have taken the opportunity to drop their foolish practices. 1. The date is what newsagents use for their accounting. That isn’t our decision. 2. The DVD is free; we don’t have a disc on every issue, and non-disc issues will be the same price. It is a free bonus on certain issues. Ok understood. Can I ask if digital subscribers will be able to download any DVDs? Yes, that’s the plan. Digital subscribers are being emailed now with details for accessing the magazine, and we’ll provide access to the DVD ISO soon as well (will take a bit longer, as we’ve put the subscriber area online earlier due to demand). Got my issue this morning – thank you for a terrific magazine, I have been enjoying it since our 1yr old son passed out after an excursion to the park – he is still asleep… There is so much interesting stuff here that I think it’ll take me a long while to really absorb it all. I particularly like brewpi, pgp, vim, bash and Philip’s den, as well as the celebrity appearances of Nick Veitch and Jonathan Roberts – can you persuade them to continue? Great stuff! Got my issue today. You hard work is evident; the magazine is saturated with good stuff, and you’ve scrimped on the fluff that other magazines use just to fill up the pages. Congratulations guys, you deserve all the praise you are getting and are bound to need a rest ……… Ok, that was enough rest, get to work on Issue 2!! and remember… after the issue is before just before the (next) issue. One congrats pint for all of you and then go back and whip the typewriting monkeys to get the next issue ready by time. You do have typewriting monkeys… do you?! Fantastic issue #1, far exceeded my expectations for a first release! Congratulations to the whole team, you’ve done an amazing job of regrouping after the fateful events that led to your depart from Future. Unbelievable how quickly you’ve managed to pull it off as well. I am so happy to see you all back in print. Got the pdf today and it looks good. Frankly I like the way you guys give attention to the community and the people in it….nice touch. LV Issue #1; how about some select samples on the website for potential subscribers who want to ‘kick the tires’? Out here in the western US there is currently a lot of curiosity about the contents of LV #1 by many who have not (yet) subscribed. How about putting up the Table of Contents and perhaps one or two select articles from LV #1 on the LV website? I believe that it could really help convert some of those who are ‘sitting on the fence’ over the cost of a subscription. Great idea, California Penguin. When the magazine goes officially on sale (27th) we’ll put up a page as you suggested, with a couple of samples. Thanks! Just a friendly reminder about posting the TOC and sample article(s) from LV #1. It would be great to be able to spread around some links to them while curiosity in the ‘new’ Linux magazine is high over here in the ‘states’. Got a message on my virtual doormat to pickup my copy. Looking forward to digging through the issue over the next few weeks. All the best for future issues. Just downloaded my digital mag and no problems. Have flicked though it and it is awesome. Well done guys, looking forward to many more issues. Thank you for the digital version of issue 1, very interesting content. However, I was disappointed to find that there has been no attempt to make this a ‘digital’ magazine. There is no pdf navigation at all ie. no bookmarks and the contents page is not linked to the articles. Worse still, most of the web addresses given are not ‘active’ (some are in Abode reader but not in Evince). Whilst I realise that this is issue 1 and so don’t expect it to be perfect, I do hope that future issues will correct this and we get a proper digital magazine rather than just electronic paper. Yes, that’s something we really want to include in issue 2. We have lots of plans for the digital editions when we have time – more formats, and more interactive elements. We’re very short of time at the moment (just four of us doing the mag content, and we’re not even paying ourselves anything yet!) but we’ll do more in the coming months. Hope you enjoy the mag. Yes, and if could also use less compression on the images they would actually be readable. But obviously the larger file size would not suit everybody. Downloaded the PDF and noticed that there seems to be missing images. Am I the only one seeing that? Just spaces where there should be an image but instead it’s just a red cross. Reading on an Android phone and tablet using Quickoffice. I shall check on a computer later today. It just seems to be random images. I’ll take screenshots of some of them. I’ve just posted some images on Google Plus showing the missing images. There are more later on, but there should be enough as an example. Thanks for posting this. I’ve just recreated the issue here, and it does seem to be specific to quickoffice. I’ll investigate what’s causing it, and see what we can do. In the mean time, a different PDF reader should display the document correctly. Good to see that the digital copies are starting to be delivered. Can you let everyone know when you think that all emails have been sent. I had trouble with my email and indiegogo. They sorted it but still concerned that you may the wrong address. So good to know when I should have had it by. You were emailed Stuart; I’ll get in touch personally and sort it out. Received issue 1 so it’s now real it exists!! Only had time for a look through so far but first impressions it looks great. Looking forward to sitting down and getting stuck in now. Congratulations guys. Waiting eagerly for issue 1 to hit the supermarkets. Hoping there’s no problem as Sainsburys near us has no clue every time I ask. Did anyone else have problems logging in? I just get an error. ERROR: The address you entered for the subscriber number ****** is incorrect. We haven’t heard of anyone else having problems. If you e-mail me at ben@linuxvoice.com, I’ll look into it. Congratulations guys – a wonderful achievement. My copy landed on my doormat on Friday and I’ve spent most of the weekend reading it, and what a great read it is. I don’t mean to be critical, but as a friend, do get someone to proof read the mag before it goes to print to eliminate those pesky typos. Congratulations again – onwards and upwards. I was a bit concerned that it would be an anti-climax after the Indiegogo campaign and the wait etc., but am pleased to say that it’s much better than I had hoped. It’s obvious that the whole project is a labour of love and much thought has gone into this. Thanks David! It has been very hectic, getting everything in place (a distributor, a printer, a disc duplicator, setting up the website, dealing with company stuff) but we did it. And we’ll actually have more time to work solely on the upcoming issues, so rest assured, we’ll do our utmost to not just maintain the standard, but make the mag even better. Cheers! Congrats on your first issue. Got back after a weekend away to find it lying innocently on the mat. It’s a great read so far; I am particularly happy that the humour, that originally attracted me to LXF is back. I have enjoyed the variety in the tutorials, and found the subjects engaging, and I now want to go out and set up my own BrewPi. The only downside so far is the editing (understandable given the time constraints, etc), typos abound, and is Drukkar a victim of necessary editing or was it just an error of omission? Keep up the good work, I’m really looking forward to the next issue and also the next podcast. Thanks Dave! Drukkar was cut, yes, but it’ll be in issue 2’s FOSSpicks. Glad you’re enjoying the mag! I really like the magazine so far – well designed, interesting content and with a lot of improvements over a magazine that some of you might have had links with… Well done! The only issue I’m having is the aforementioned problem with the format. The PDF I received has a high resolution – too much for my Nexus 7 to handle in a comfortable way (I need to wait 2-3 seconds after swiping). A clickable table of contents would also be useful. Thanks for the feedback. Which PDF reader are you using on the Nexus 7? Some have better performance than others. The resolution isn’t super-high (otherwise the PDF would be 300+MB rather than 60MB) but maybe we can fine-tune it. And yes, a clickable/tappable contents page is something we have planned for the next issue. Never thought there would be big differences. Using Alkido at the moment, as it provides a good overview and I can continue where I stopped reading. Happy to try alternatives if someone has a recommendation! Is there any way of getting my hands on a print edition of issue 1 if I do not live in the UK? Looks like I missed the deadline for order a subscription starting with this issue… Online shop does not show any options for back issue purchases. Which country are you in? It will be on sale in various newsagents around the world, apart from the US. We also plan to sell single issues on our online shop. I just subscribed to the digital edition, will I get issue 1 – I hope so! 1st issue is superb! Congrats to all involved! You’ve really done an amazing job in a very short space of time. You deserve to be proud. Linux Voice is THE Linux story of the year! My magazine is still not here in Vienna. Is this normal or should I worry that it is lost? Has anyone in the US or Canada received their print sub issue #1 yet. Just curious – no complaint. Besides – there’s a PDF! US and Canada subscribers should be receiving their copies very soon. If you haven’t got yours by the middle of next week, let me know. OK – will do. Looking forward to it. Thanks. I see that on the 21st the print subscription went out (congratulations). I am a US subscriber, so mine I’m sure will take a while. My question is, how long (your best guess would be fine). Your print copy should arrive by the middle of next week at the latest. If it’s still not there by then, email me (mike@linuxvoice.com) and I’ll look into it. Good news, arrived today … thank you! I’m desperate for Linux goodness in the Ruhrgebiet. Is european distribution a week behind? Do you mean in newsagents, or as a subscriber? I could actually login with the address and see the pdf but I thought I had a print subscription. You do have a print subscription — email me (mike@linuxvoice.com) and I’ll sort it out.